A solo kayak moves silently through the pristine waters of Johnstone Strait off the coast of Northern Vancouver Island,British Columbia in Canada. Opportunities for recreation on the water abound in this particular region with a vast amount of kayaking trips available. 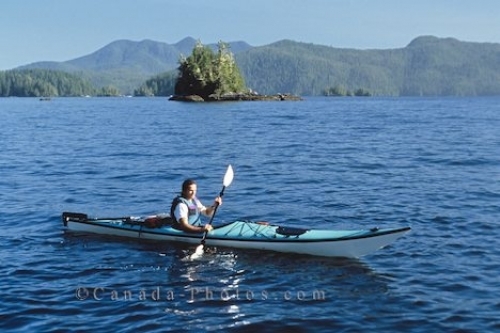 Picture of a man on a kayaking trip paddling through Johnstone Strait off Northern Vancouver Island, British Columbia.